Beneath the museum are the vaults that house more than 95 percent of the museum’s collection at any given time. It’s a place that most of the museum’s staff rarely get to see. But last week Paul Lavy’s Art 791 class from the University of Hawai‘i at Mānoa got the chance to view a few works in the vaults and discuss 20th-century arts of the Philippines. The discussion is part of Lavy’s art history master’s student seminar that involves independent research projects for three graduate students—Emily Hebert, Caroline Baicy, and Kristin Remington. 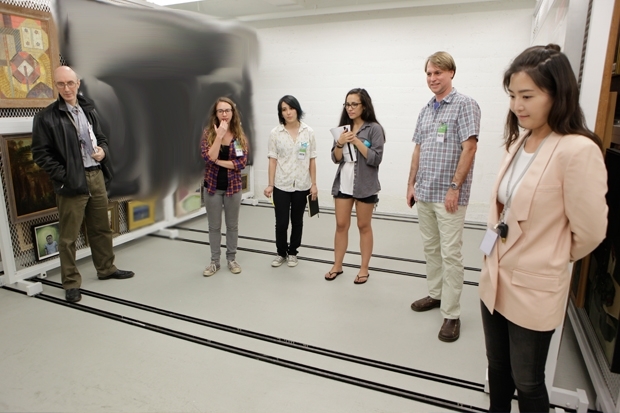 The projects focus on objects relevant to the students’ chosen field of study. Since Sept. 3, the trio has visited the museum’s Asian galleries on a weekly basis to research these objects, and last week was their first vault viewing. The students will return to the museum vaults every week until Nov. 19 to look at Cambodian and South Asian Art, which are Remington’s and Hebert’s areas of interest respectively.